"I'VE BEEN IN THE HVAC-R INDUSTRY FOR 14 YEARS." "I’ve been in the HVAC-R industry for 14 years." 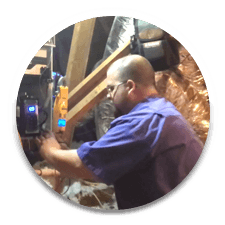 "I started as a residential installer. After 7 years I moved to service. I took a job at ATS Mechanical in Bordentown NJ. They taught me everything from oil & gas hydronic heating, commercial refrigeration, commercial and residential heating and cooling. They truly kickstarted my career as a service mechanic. I can’t thank the owner and employees enough for what I’ve been taught." "Currently I work for a large commercial national accounts contractor. It’s all 5-50-ton rooftop units. 100% commercial company. I have the ability here to make my own schedule, write up my own repair quotes, and hire the outside contractors like plumbers and electricians. I enjoy that I’m able to do both administrative and the mechanical aspects at this job. Its preparing me for the ultimate goal which is starting my own business." "As I continue to grow and take on more responsibility. In my growth I need to be more organized, so I can perform repairs at a higher quality and efficiency. A buddy of mine turned me to Veto Pro Pac. I am now not only organized but I’m also not buying a new bag every year. I’m going on 7 years with my oldest bag. Still no rips and it performs like the day I bought it."